There are days when we all feel we need a break from the stress of work or school, and more often than not, a getaway is the perfect solution to simply get our groove back! Traveling is, indeed, an effective method to relax and unwind no matter how short the period of time may be. Wherever you feel like heading, be it the unbelievably beautiful beaches of Jamaica or the dazzlingly romantic streets of Paris, to travel means to plan ahead of time and organize not just your wardrobe and itinerary but also your finances, accommodations and transportation. On the Internet, several websites can definitely help you in that department and make things a little easier for you to sort out. Take a look at two of the most efficient websites, Expedia.com and Hotels.com. Expedia Inc. is a Washington-based company that specializes in travel bookings, hotel reservations and other travel-related concerns. It was created by Microsoft in 1995 and was later sold to InterActivCorp in 2001. The website Expedia.com happens to be its the name-bearing Internet-based travel center, which aims to make it more convenient for vacationers to organize things such as car rentals, cruises and the like. Hotels.com also happens to be one of Expedia Inc's products. It started out as a telecommunications operation in Dallas, Texas, offering a toll-free telephone service for travelers to be able to find discounted hotel rooms within the United States. It was originally founded in 1991, and was later on further developed as a website under Expedia Inc. Both Expedia.com and Hotels.com have contributed significantly to the travel industry in terms of their link to technology and new media. They have joined the slew of many websites found on the Internet that offer to make traveling a lighter load, than with traditional planning strategies. They are now what we can call "online travel agencies", which can help a potential traveler map out his or her plans without leaving the comfort of his office or home. What makes Expedia.com different from Hotels.com-besides the domain, of course-is that Expedia.com offers a broader array of services. While Hotels.com specializes in its namesake and that alone, Expedia.com is more diversified in its service offerings. When one visits their website, there are many tabs pointing to the specific area of travel which one may need to organize: vacation packages, hotels, cars, flights, cruises and activities. Furthermore, it even has a helpful tab which shows maps, business travel assistance and rewards. It also has a button for special deals and offers. Expedia.com is a whole lot more developed than Hotels.com, in terms of the number of services provided. Expedia.com is the name-bearer of a company, Expedia Inc. that also holds Hotels.com; both are under one company. Both Expedia.com and Hotels.com are considered part of the revolutionary "online travel agencies". While Expedia.com offers many services such as cruises and airline ticket reservations, Hotels.com specializes only in hotel reservations. Best deals on hotel reservations? 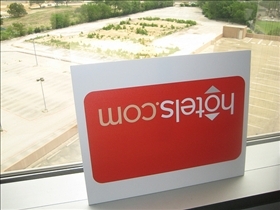 Hotels.com is full of hidden charges and non-refundable costs. The savings they offer quickly evaporate. They also have abonomobile customer service with LONG waits on hold, non-existant supervisors and hangups. Since Expedia and Hotels.com are related I would expect the same level of (in)copentence from both. Definately NOT recommended.